The new Toyota Prius Plug-in Hybrid looks spaceship-like, but is it as exciting as it looks? Tim Barnes-Clay put it to the test at the International Launch in Barcelona. Let’s get one thing answered – the 2017 Toyota Prius Plug-in Hybrid is not exciting, okay? But, that doesn’t mean it’s a bad car. So, let’s be positive here and start with its good points. This is one very ingenious machine, with some awesome features – the most outstanding being the solar panel roof that can place just enough ‘go’ into the Toyota’s drive battery for an extra few free miles every day. The Prius PHV - as it’s abbreviated to - also has a refreshed electric powertrain. A large 8.8kWh lithium ion battery is housed under the floor of the Toyota’s boot, together with a hi-tech electrical arrangement to move clout through it. This works well and provides, what is essentially a fourth-generation Prius, some worthwhile shove, especially as the car also has a twin motor hybrid powertrain. This raises pure electric power from 72PS to 103PS. All this gives the Toyota five-door hatch a maximum speed of 84mph when driven in unadulterated electric mode. Mind you, you can only get away with this form of propulsion for so long – the electric range is 39 miles, but expect 20-25 miles real-world. 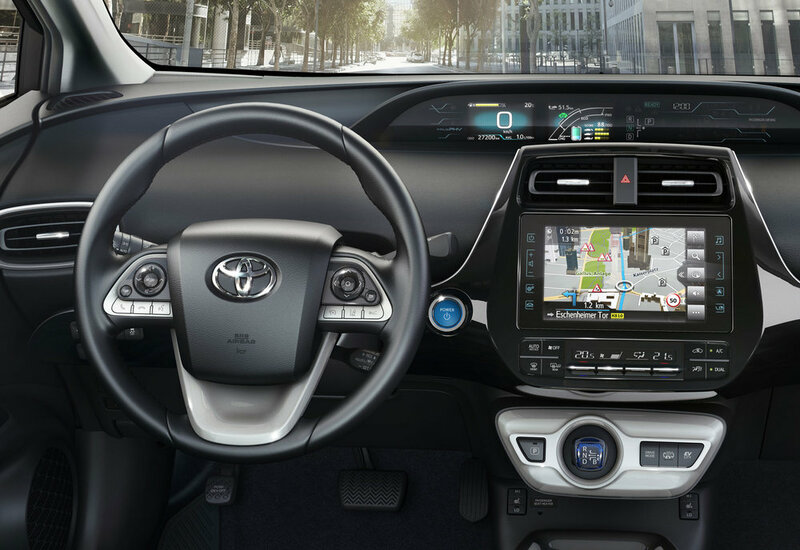 The Toyota Prius Plug-in Hybrid also has a 1.8 petrol engine, and along with the electric wizardry, 122PS is produced – giving a zero to 62mph time of 11.1sec and a maximum speed of 101mph. Hardly exciting, as I said earlier – but it’s not abysmal performance, either. More importantly, the Prius PHV breaths out a tiny 22g/km of CO2 and it’s possible to get 283mpg out of the car. No, that’s not a typo – that’s the claimed figure. Of course, reality doesn’t always match up to what we’re told, and on a long motorway stretch, I only managed to get 59mpg – but then I did have my foot down – and hardly used electric mode. Instead, I mucked around with the ‘Normal’ ‘Eco’ and ‘Power’ settings, seeing what difference they made to the car. It’s difficult to tell much difference between ‘Eco’ and ‘Normal’ – but the ‘Power’ mode does give you a bit of a push in the back – and a lot more noise – reminiscent of a slightly unhinged vacuum cleaner. Anyway, away from the tech and figures, the new Prius PHV is pretty similar to the normal Prius – apart from a couple of things. 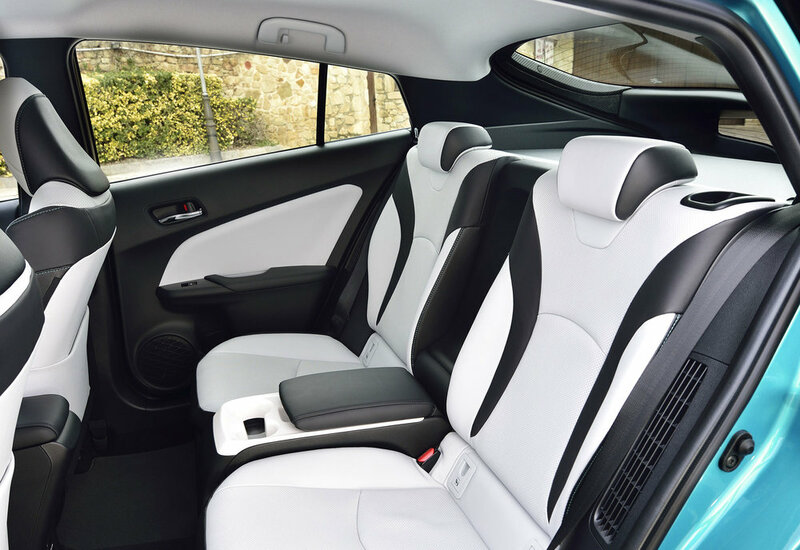 Unlike the regular model, it’s only got two seats in the rear – so it’s a strict four-seater - and the boot is smaller. This is all due to the bigger, newer battery. So, there is a trade off after all, I hear you cry. Yes, these two things could well be a deal-breaker for some potential buyers or leasers. Oh, and I nearly forgot - there is one other notable way of telling the PHV apart from the usual Prius: its rear lights are horizontal, not vertical. I think it looks better this way. 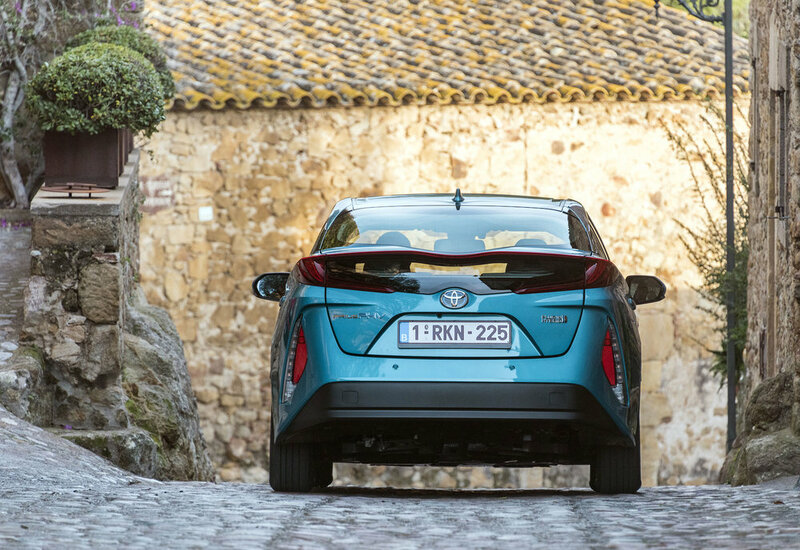 On the move, the car is hushed, due to extra sound-deadening materials, and, when I did venture off the motorway onto Spanish rural routes, the Prius handled corners with barely any lean at all. This is down to retuned suspension springs and dampers. However, there is another trade-off – the tauter set-up means the car does bang and crash over potholes. Yet, back on smooth surfaces, the Toyota feels refined and, when using electric-only mode, I found the car almost silent. Only the whoosh of wind and tyre rumble disturbs the otherwise library-like calm in the cabin. Once I’d stopped hooning the PHV and started using the electric settings, I achieved a hybrid-mode fuel economy figure of 69mpg – which is loads better than many Plug-in Hybrid Electric Vehicles (PHEVs) will do. Alas, that’s only a tiny fraction – probably about 5mpg - better than you’d eke from a run-of-the-mill Prius. It’s also hard to recommend this car over the excellent regular Prius – due to its strict four-seater configuration and its shallower boot.